You may already know that coconut oil has many benefits, but did you know that it may help keep your skin more youthful? It’s been said that coconut oil is effective at delaying wrinkles, as well as helping with dry skin and psoriasis. Skeptical? Only one way to find out! 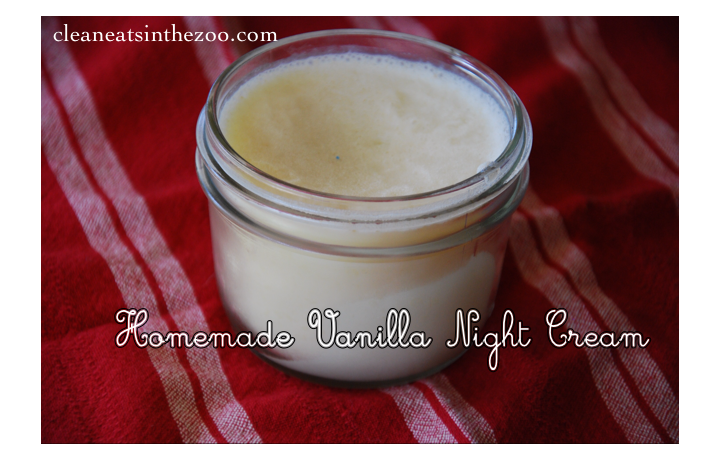 Try my homemade vanilla night cream for a month and see if you notice a difference! This recipe just has 4 ingredients! It’s so simple and smells amazing. And your skin will feel silky smooth after using it. Try it every night for a month and see if you notice an improvement in your skin! In a double boiler, melt together all ingredients. Pour into a small jar (I used an 8-oz mason jar and had a little extra). Please Note: This needs to be stored in the fridge if you want it to stay solid. At room temperature, it will be mostly liquid. It will still work, however. If stored in the fridge, it is solid and you can take a small spoonful out to rub on your face each night. I left a comment a couple of Mondays ago when you asked if anyone needed prayer. I did want to let you know, that the child I asked for her to be placed where she is going to be safe – has been moved into my home. The one stipulation is I have to drive 3 hours one way twice a week to accommodate the needs. I have 4 other kids that I home school and am a bit worried about this. Would you please pray that God will work out the driving part? Thank you. Sarah, yes! We remember you. Will definitely be praying. Back when we got our youngest, I had to drive almost an hour each way twice a week to take her to visits with her birth mom. I thought that was rough with 4 other kids, but 3 hours?! I will definitely be praying. Is it an option to have the social workers take some of that responsibility? I am very intrigued by this. I’ve always felt the coconut creme concentrate is kinda gritty. I can’t imagine it “soaking in” but I think I’ll have to try it just to prove myself wrong. Do you cleanse first? Where do you purchase cacao butter? Hi, Bonnie! The cream feels a little gritty at first, but rubs in just great! I wash my face first. I got my cacao butter on Amazon! Is there a reason other than scent that you use vanilla? Essential oils such as lavender could be used instead I am assuming. Thanks for posting! I have been looking for a good recipe to use. Nope, it’s just what I had on hand. I actually wanted lavender, but since I didn’t have it, I used vanilla. lol Any essential oil would work great!